Welcome, Eaters. The Po-Boy Saga starts here, for the chronologically minded. In tournament golf, Saturday is called Moving Day. Similarly, Day III of a po-boy and absinthe bender is when you start to winnow the wheat from the chaff. Unaccountably, we got off to something of a late start. Feeling rather peckish, we formulated a plan to visit the Bluebird, where I plan to have my last meal, if I can talk the warden into an early afternoon time slot. Sadly, the Bluebird was closed--it is operating on a Wed-Sun schedule. Though we were still on the AM side of noon, cinetrix and our gracious host gamely agreed to join me in breaking the fast at Domilse's. I'd gotten skunked in my last visit, and was eager to see how they were, post storm. In retrospect, I'm not sure what I was worried about. For the most part, Uptown did not flood, and hurricanes do not make folks forget how to cook. So, reassuringly, Domilise's was as it ever was. That's good. Whatever else New Orleans offers the eater, I can think of no other city that offers so many transcendent eating experiences in such unpromising settings. 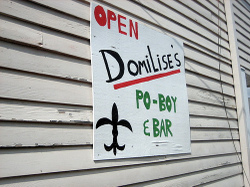 Domilise's is in a weathered building on an unprepossessing residential block in a remote corner of Uptown. The interior features faded clippings and football memorabilia, heavy on the Mannings. It looks like a bar with seating, rather than a food-oriented place. If you imagine a slightly larger and darker Paddy's Lunch, you're getting warm. Our bold strategy of po-boy elevenses put us just ahead of the lunch rush, which was a good thing. The sandwiches were delicious as ever. I went with roast beef -- thin-sliced well-roasted beef, on a long bun with gravy, lettuce, tomato and pickles. There is nothing remarkable about any of this. This gravy has that same slightly mysterious relation to homemade gravy that you see with poutine gravy, but I think it works better than home made would. It sounds unpreposssessing, and less exotic than the seafood po-boys, but it was just the thing. A Domilise roast beef po-boy is one of those puzzling things that is so much more than the sum of its parts. I suspect the bread may be the key -- it does not call attention to itself like some levain at a Berkeley farmer's market. It does its job, and allows its mates to do theirs. Like Willie Roaf. Our gracious host opted for shrimp and oyster, and cinetrix for catfish. One unheralded bonus of ordering the RB PB is that someone in your party will almost certainly order shrimp and/or oyster. One fact of life with these sandwiches is that you will inevitably have a few fried shrimp or oysters escape, and the alert dining companion can snag one on the bounce before it is restored to the sandwich. While we were polishing off our elevenses, the phone rang, with the Empress confirming the lunch date we'd arranged the day before. In our naivete, we'd imagined breakfast Uptown would not immediately become lunch in Mid City, but so be it. The Empress is the daughter of friends of ours, and a friend in her own right. As a sophomore at Franklin, she shows a charmingly atavistic interest in the kind of place you might find Jughead. And the Velvet Underground. In any case, that's how we found ourselves at Bud's Broiler about two hours after breakfast. Unfortunately, I was feeling just a little bit seedy at this point, but I did enjoy my #5 considerably. This was my first trip to Bud's. I did not live near one when I lived in NO, and it is not New Orleans-y enough to attract much attention from visitors. More on this phenomenon later. Bud's would be a valuable addition to any city's food options. This is the kind of place from whence fast food burger joints have devolved so shamefully. Nominally, the menu offerings are similar to fast food, but I saw one of the cooks feeding whole onions through a vicious-looking device that diced them. The last time a whole onion was in a Mickey D's, it was probably tied to Grandpa Simpson's belt. Duty calls. Stay tuned for sazeracs and bistros.
. . . it was the style, at the time. What about Crabby Jack's? Jack does some amazing po-boys!